On December 20, 2017 Congress passed H.R.1, the Tax Cuts and Jobs Act, which has now received the President's signature and took effect on January 1, 2018. There are many intricacies to the new bill to explore, but there are a few major takeaways on how it will affect homeowners over the next seven years. The bill keeps the option to exclude up to $500K of gain on the sale of a primary residence. The bill keeps business interest deductions for real estate, plus Section 1031 like-kind exchanges for real property, which will ensure that the costs of home financing remains affordable and real estate activity remains a vibrant part of the economy. 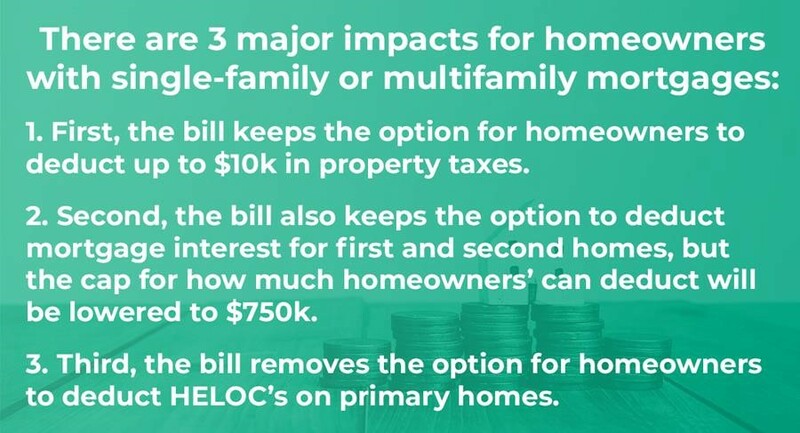 The bill keeps the Low-Income Housing Tax Credit (LIHTC) and the tax-exempt status for private activity bonds (PABs), tow rules that will help preserve options for affordable multi-family housing and consumer access to affordable mortgage credit. I found a great article from the National Law Review with a comprehensive and user-friendly breakdown of other highlights from this new bill -> check it out HERE.